“Kootenay winters are the best because the snow is amazing, backcountry options are endless, and the mountains still blow my mind after eight years of living here,” says Andy Brown, a Golden, BC local. It’s true: If you need more white-capped peaks in your winter lineup, we’ve got a sea of them here—and they’re one heck of a playground for sledders. Our mountains have all the terrain you need. High avalanche day? We’ve got low-angle slopes to cruise around on. Perfect conditions to test gravity? We’ve got more steeps than the prices at Tiffany’s. “Fernie has over 150-km of groomed trails with five distinct staging areas serving as gateways to thousands of acres of riding terrain,” says Nicole Matei, administrator for the Fernie Snowmobile Association. The association, which manages a healthy portion of the grooming in the area, also provides sledding info on four of the region’s most popular areas: Rolling Hills, The Notch, Hartley Lake, and Corbin. These areas, along with the vastness of terrain Fernie supplies in addition to the hotspots, provide sledding areas for all levels of riders. But Matei says the area is most known for its technical trees and vast meadows—all of which are covered with nine metres of powder each winter. “Golden, BC is a world-class destination for backcountry snowmobiling … [located at the confluence of two historic rivers and at the foot of the majestic Purcell Mountain Range,” says Golden Snowmobile Club board member, Tim Grey. And it seems to be in a perfect blend between sun and snow. “Heading west … you'll find more frequent and heavier snowfall, go east … and you'll find more sunny days, but Golden falls right in the middle with a blend of the two climates,” says Colin Wallace, President of the Club. Wallace gives insight into Gorman Lake—an alpine playground with natural jumps, cliff drops, and steep climbs— and Silent Pass, which offers low traffic days on rolling alpine meadows, tight technical trees and an old burn site. But Grey gives a nod to Quartz Creek as one of the Golden’s most popular snowmobile areas, referencing its variety of terrain that appeals to beginners and those who enjoy technical playtime, too. “The Nelson Kootenay Lake region is unique because of its steep and deep mountain terrain—with endless beautiful views,” says Billy Stevens, vice president of the Nelson Sno-Goers Club. The club, which began in 1971, maintains cabins as well as popular trails in the region, covering the areas of Crusader, Giveout Creek, Lemon Creek, Six Mile Lakes, Springer, and Redfish Creek. But, according to Stevens, one area in the region deserves special attention. “Every visitor should experience the Meadow Mountain area,” says Stevens. Described as having “...safe, high-alpine meadows with an easy groomed trail to access … breathtaking views”, the Meadow Mountain is also home to one of the Club’s popular cabins. Located at the base of the meadows, this historic backcountry cabin is warmed through its wood stove and can be booked overnight for up to five people—or book it for the day so your crew can warm up while eating a hot lunch. 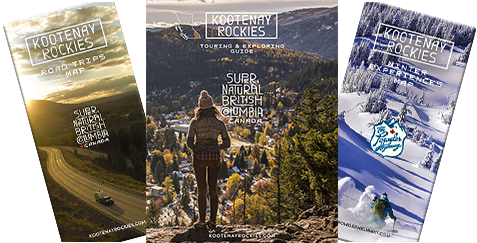 Revelstoke locals have been celebrating the snowmobiling terrain in their regions for at least fifty years. Half a century ago, the Revelstoke Snowmobile Club began, and Miranda Murphy, a Revelstoke local, chalks up the undying love of riding here to two things: legendary powder and huge area of terrain available for sledders. And then there’s the snow. “Everyone who rides here has a story about that ‘perfect day where the snowflakes were the size of quarters, the snow was over the bars and with every turn the whole sled disappeared into the powder.’” In Revelstoke, she says, those stories come to life because the snow is falling more often than not. Words by Gina Bégin and top/cover photo by Billy Stevens (near Nelson Kootenay Lake).